Spring has come to the meadow. Little Chipmunk woke from his long winter sleep, and he was hungry! He looked for the seeds he had buried in the fall, but they had disappeared. In their place was the shoot of a mysterious plant. Spring turned into summer, and the mysterious plant grew and grew. Then fall came, and with it a wonderful surprise for Chipmunk. 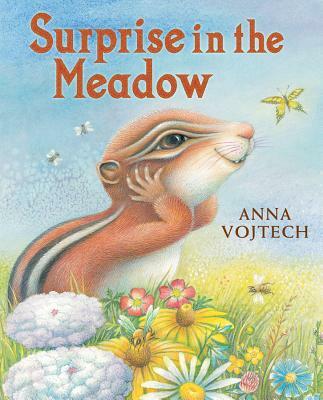 Anna Vojtech's sweet story, set in a lush meadow landscape, introduces young children to the life cycle of the sunflower. Anna Vojtech grew up in Prague, in what is now the Czech Republic, where she studied art and toy design, film animation and graphics. She also attended the Royal Academy in Antwerp, Belgium, and the Academy of Fine Arts in Hamburg, Germany. She now lives and works in Gloucester, Massachusetts. Anna has illustrated many books for children, including Ten Flashing Fireflies by Philemon Sturges, Tough Beginnings by Marilyn Singer and a picture book adaptation of Olive A. Wadsworth's counting rhyme Over in the Meadow, which has been published in seven languages. Her botanical paintings were collected in Wild Flowers for All Seasons and have been exhibited in the United States, Canada, and England.